อานาปานสติ กุญแจไขความลับของชีวิต Anapanasati: Mindfulness with Breathing: Unveiling the Secrets of Life: a manual for serious beginners) by Buddhadasa Bhikkhu. Translated from the Thai by Santikaro Bhikkhu. Thai/English bilingual edition. N.p, n.d. 174 p.
A Buddhist Charter by Buddhadāsa Bhikkhu. Translated from the Thai (กฎบัตรพุทธบริษัท) by Mongkol Dejnakarintra & Somsri Thammasarnsophon. The Dhamma Study & Practice Group, n.d. 56 p.
Christianity and Buddhism (Sinclaire Thompson Memorial Lecture Fifth Series) by Buddhadasa Bhikkhu. Message of Truth from Suan Mokkh: Comments on Education by Buddhadasa Bhikkhu. An article written at Mokkabalārāma on 29 March 1988. Translated from the Thai by the Dhamma Study & Practice Group. Leaflet. N.p., n.p., n.d. 7 p.
Dhamma is Duty, Duty is Dhamma by Buddhadasa Bhikkhu. From the documentary video "Life and Work of Buddhadāsa Bhikkhu" by the Foundation for Children, Bangkok. Translated from the Thai by Santikaro Bhikkhu. Leaflet. 'Buddhadasa & World Peace Series.' Buddhadharma Meditation Center, Hinsdale, n.d. 5 p.
Translated from the Thai by Santikaro Bhikkhu. Leaflet. Reprint. Atammayatarama Buddhist Monastery, Woodinville, n.d. 5 p.
Disadhamma: Mankind's Pathway Dhamma by Buddhadasa Bhikkhu. Series of 6 discourses to temporary monks. Translated from the Thai by Mongkol Dejnakarintra. Dhamma Study and Practice Group, Bangkok, n.d. 80 p.
Food for Thought: Some Teachings of Buddhadasa Bhikkhu. Translated from the Thai (อาหารใจ) by Grant A. Olson. Buddhadhamma Meditation Center, Hinsdale, n.d. 74 p.
Food For Thought by Buddhadāsa Bhikkhu. Translated from the Thai (อาหารใจ) by Grant A. Olson. Atammayatarama Buddhist Monastery, Woodinville, n.d. 20 p.
Translated from the Thai by Ariyananda Bhikkhu (Roderick Bucknell). Third edition. Buddhadasa Foundation, Bangkok, n.d. 237 p.
Translated from the Thai by Ariyananda Bhikkhu (Roderick Bucknell). Dhammasapa, Bangkok, n.d. 237 p.
Translated from the Thai by Ariyananda Bhikkhu (Roderick Bucknell). Thammasapa & Bunluentham Institution, Bangkok, n.d. 237 p.
Handbook for Mankind (Part I) by Buddhadasa Bhikkhu. 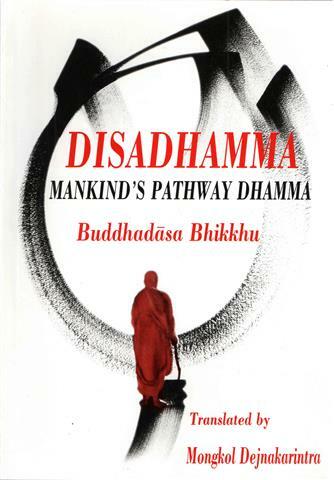 Being Chapters I-III of Handbook for Mankind : Principles of Buddhism explained by Buddhadasa Bhikkhu. Translated from the Thai by Ariyananda Bhikkhu (Roderick Bucknell). N.p, n.d. 52 p.
Handbook for Mankind (Part II) by Buddhadasa Bhikkhu. Being Chapters IV-VII of Handbook for Mankind : Principles of Buddhism explained by Buddhadasa Bhikkhu. Translated from the Thai by Ariyananda Bhikkhu (Roderick Bucknell). N.p., n.d. 56 p.
Translated from the Thai by Ariyananda Bhikkhu (Roderick Bucknell). Young Buddhist Association of Malaysia, Penang, n.d. 56 p.
Handbook for Mankind (Part III) by Buddhadasa Bhikkhu. Being Chapters VIII-IX of Handbook for Mankind : Principles of Buddhism explained by Buddhadasa Bhikkhu. Translated from the Thai by Ariyananda Bhikkhu (Roderick Bucknell). N.p, n.d. 44 p.
Translated from the Thai by Ariyananda Bhikkhu (Roderick Bucknell). Young Buddhist Association of Malaysia, Penang, n.d. 44 p.
A Handbook for the Practice of Ānāpānasati Bhāvanā by Buddhadasa Bhikkhu. Āsālha Pujā series of lectures. Talks 4 to 7: "Kāyānupassanā-satipatthāna กายานุปัสสนาสติปัฏฐาน," "Vedanānupassanā-satipatthāna เวทนานุปัสสนาสติปัฏฐาน," "Cittānupassana-satipatthāna จิตตานุปัสสนาสติปัฏฐาน," and "Dhammānupassanā-satipatthāna ธัมมานุปัสสนาสติปัฏฐาน." Translated from the Thai (คู่มือ อานาปานสติ-ภาวนา) by J. Ratana Nantho Bhikkhu. 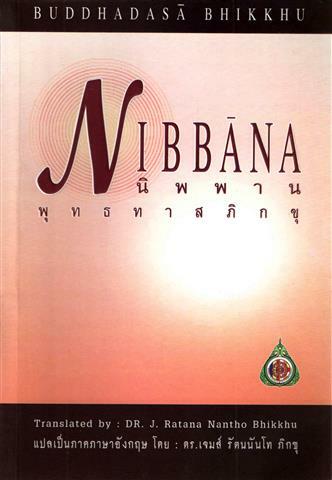 Trilingual edition (Thai/English/Chinese). Sponsored edition. 376 p.
Happiness and Hunger ความสุขกับความหิว by Buddhadasa Bhikkhu. A Dhamma lecture given to foreigners attending a meditation course at Suan Mokkh, on 7 May 1986. Happiness and Hunger by Buddhadasa Bhikkhu. Translated from the Thai (แก่นพุทธศาสน์) by Dhammavicayo. n.p, n.d. 104 p.
Translated from the Thai (แก่นพุทธศาสน์) by Dhammavicayo. [Thammasapa, Bangkok], n.d. 104 p.
Translated from the Thai (แก่นพุทธศาสน์) by Dhammavicayo. Thammasapa, Bangkok, n.d. 104 p.
Message from Suan Mokkh: Help! Kālāmasutta, Help! by Buddhadāsa Bhikkhu. An article written at Mokkabalārāma on 6 May 1988. Translated from the Thai by Santikaro Bhikkhu. Sponsored by Somsawan Wilken. Atammayatarama Buddhist Monastery, Woodinville, n.d. 16 p.
Message of Truth from Suan Mokkh: Help! The Kālāmasutta, Help! by Buddhadasa Bhikkhu. Translated from the Thai by the Dhamma Study & Practice Group. Leaflet. 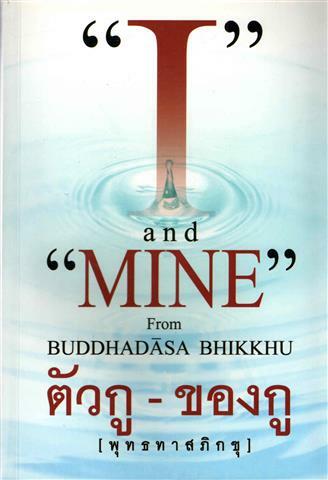 N.p., n.p., n.d. 10 p.
"I" and "Mine" by Buddhadasa Bhikkhu. 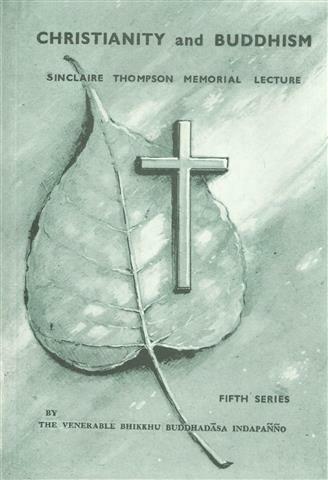 Series of Rains Retreat lectures given in 1961 and made into the book Tua Ku Khong Ku. Message of Truth from Suan Mokkh: Kamma in Buddhism by Buddhadasa Bhikkhu. An article written at Mokkabalārāma on 7 April 1988. Translated from the Thai by the Dhamma Study & Practice Group. Leaflet. N.p., n.p., n.d. 8 p.
Translated from the Thai by the Dhamma Study & Practice Group. Leaflet. Buddhadhamma Meditation Center, Hinsdale, n.d. 9 p.
Message of Truth from Suan Mokkh: Let's Become A Buddhadāsa by Buddhadasa Bhikkhu. An article written at Mokkabalārāma on 30 April 1988. Mindfulness with Breathing: Getting Started by Buddhadasa Bhikkhu. From an article written on 28 August 1948. Adapted and translated from the Thai by Santikaro Bhikkhu. Leaflet. N.p., n.p., 9 p.
Transl. from the Thai (ไม่มีศาสนา) by Bhikkhu Puñño. Revised by Santikaro Bhikkhu. Sponsored by Wannee Brouillette. Atammayatārāma Buddhist Monastery, Woodinville, n.d. 64 p.
Being "Nibbāna : The Destination of Life นิพพาน จุดหมายปลายทางของชีวิต," "Some Wonderful Aspects of Nibbāna ความอัศจรรย์บางประการของนิพพาน" (discourse delivered on 22 August 1943), "Life for Nibbāna ชีวิตกับนิพพาน," and "The Dawn of Nibbāna รุ่งอรุณของนิพพาน" (six "Legacies" from the book prepared in 1986 for Buddhadasa's 80th birthday). Message of Truth from Suan Mokkh: Nibbāna for Everyone by Buddhadasa Bhikkhu. An article written at Mokkabalārāma on 3 April 1988. Message from Suan Mokkh: Nibbāna For Everyone by Buddhadāsa Bhikkhu. An article written at Mokkhabalārāma, Chaiya on 3 April 1988. Translated from the Thai by Santikaro Bhikkhu. Atammayatarana Buddhist Monastery, n.d. 16 p.
Paticcasamuppada : Practical Dependent Origination by Buddhadāsa Bhikkhu. Translated from the Thaiby Stephen Schmidt. Suan Mokkhabalarama, Chaiya, n.d. 128 p.
Translated from the Thaiby Stephen Schmidt. Reprint. Suan Mokkhabalarama, Chaiya, n.d. 128 p.
Translated from the Thaiby Stephen Schmidt. Reprint 2002 free distribution edition. Thammasapa, Bangkok, n.d. 128 p.
The Prison of Life คุกของชีวิต by Buddhadasa Bhikkhu. The Prison of Life by Buddhadasa Bhikkhu. Message of Truth from Suan Mokkh: A Single Solution for All of the World Problems by Buddhadasa Bhikkhu. An article written at Mokkabalārāma on 6 April 1988. 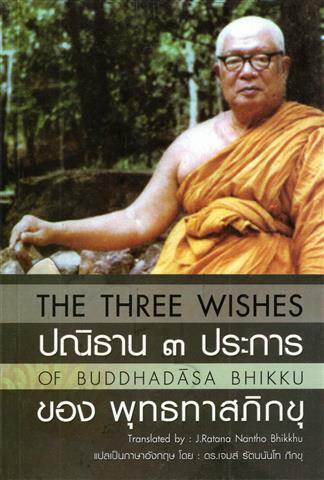 The Three Wishes of Buddhadāsa Bhikkhu. Being "The Merits of Apologizing and Forgiving อานิสงส์ของการขอโทษ-อดโทษ," and three Dhamma discourses delivered on Buddhadasa's birthday: "The First Wish : Try to Get to the Core of One's Own Religion พยายามเข้าถึงหัวใจศาสนาของตน," "The Second Wish : Building Mutual Understanding Between Religions การทำความเข้าใจระหว่างศาสนา," and "The Third Wish : To Lead the World Out of Materialism การนำโลกออกมาเสียจากวัตถุนิยม." What did the Buddha teach? by Buddhadasa Bhikkhu. Being questions #1, #3 and #29 of Buddha-Dhamma for Students. Translated from the Thai (ธรรมะกับนักศึกษา) by Ariyananda Bhikkhu. Leaflet. Bilingual. n.p, n.d.
What did the Buddha Teach? 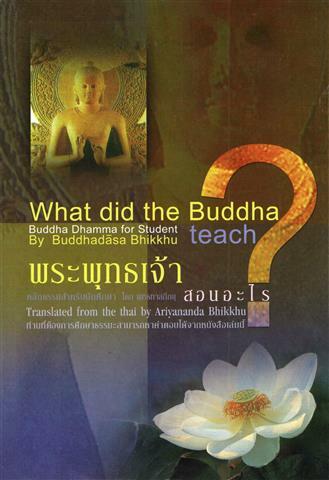 : Buddha Dhamma for Students by Buddhadasa Bhikkhu. Translated from the Thai (ธรรมะกับนักศึกษา) by Ariyananda Bhikkhu. Bilingual edition. Thammasapa & Buenluentham Foundation, Bangkok, n.d. 237 p.
Why Were We Born? by Buddhadasa Bhikkhu. Translated by Ariyananda Bhikkhu (Roderick Bucknell). Wisdom Series No. 12. The Buddhist Missionary Society, Kuala Lumpur, n.d., 32 p.